We are enjoying watching the birds at our feeder this winter. They add action and color to an otherwise static winter scene. Bird watching is a popular hobby in America. According to a 2016 US Fish and Wildlife Service survey, more than 45 million people watch birds around their homes and away from home. If you aren't already, you too can be a birder. All you need is the will and some basic equipment. Most people use binoculars to bird. The most common ones that I see are 7 x 35. The first number signifies magnification and the second number gives the size of the lens in millimeters. A bigger ratio of magnification to lens size gives a sharper image. Therefore an 8 x 42 is sharper than an 8 x 32; however, the 8 x 42 is larger and more bulky to carry. Regardless of the type of binoculars you have, you need to know how to use them. Binoculars need to be calibrated for each user, using the single adjustable eyepiece knob. Everyone's eyes are different, so they must be calibrated for your eyes. Once you know your number, it will never change. For my binoculars, I use the 2+ setting, while my husband's setting is different. Adjust the binoculars to fit your eye width using the center hinge. If you wear glasses, roll the rubber edge down or twist each eyepiece all the way inward. Those without glasses need that extra space left alone. Finally, rotate the center wheel to focus both eyes on the subject in view. 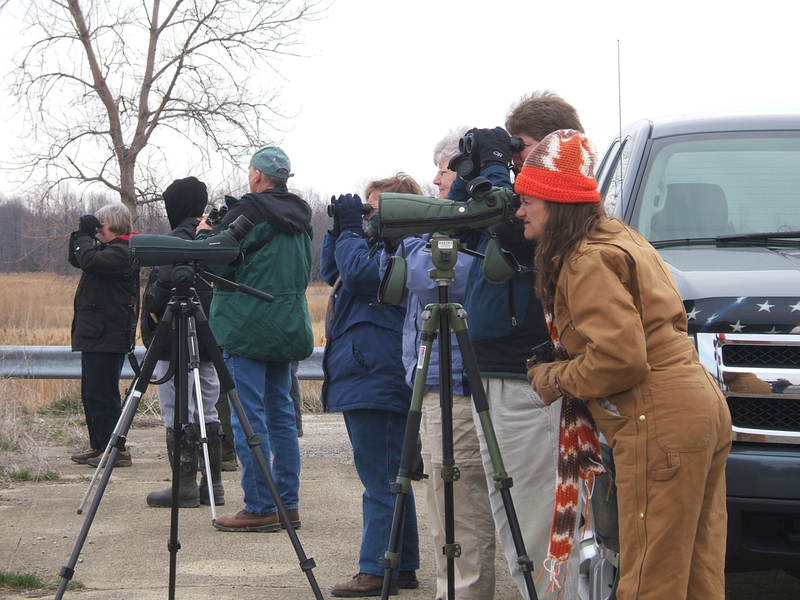 If you are serious about birding, you might also consider getting a spotting scope. Spotting scopes work from a farther distance away and often require a tripod for stability. Scopes magnify a subject 20x to 80x, compared to the 7x or 8x on most binoculars. 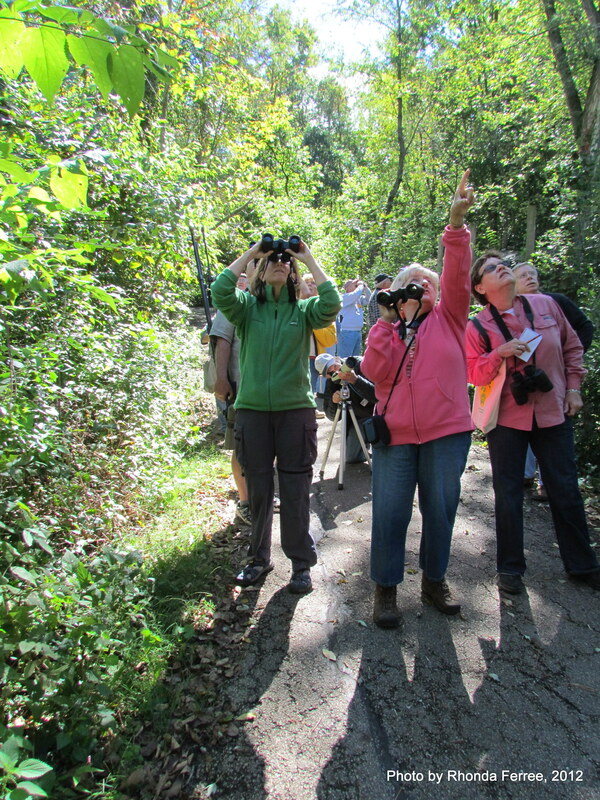 Birders typically carry a notebook to record their findings. Some also use their smartphone or tablet to play bird calls and look up identification characteristics. One of my favorite birding websites is the Cornell Lab of Ornithology at www.birds.cornell.edu. There you'll find directions on calibrating your binoculars and downloadable birding checklists for your location. Start building your bird life list today. Birding from the comfort of your home is a fun winter activity. I recently produced a YouTube video on bird feed types and tips. I talk about how adding variety to your bird feeders attracts a wider variety of birds. Learn about types of seed and feeders that you can use in your yard. All of my YouTube videos are available at go.illinois.edu/ILRiverHortvideos.